I generally quite like shopping at Aldi. They have an interesting range of produce when compared with other supermarkets and the weekly offers on fruit and vegetables, cheeses etc. are difficult to beat. The meat selection isn't that good and it can be a bit pricey although you can sometimes pick up a bargain. It's not what they sell that bothers me though, it's what happens when you get to the checkout to pay for your groceries. This has happened to me so many times I've lost count. Whenever I head towards a particular checkout the assistant will often direct me to the next one down which invariably has a longer queue by the time I get there. It's annoying for sure, but by no means my biggest gripe with the checkouts at Aldi. My main gripe with Aldi is the checkout process itself. It's very fast, but it's certainly not fun and I'd imagine this streamlined approach is one of the reasons they are doing so well and can offer such good prices. They seem to have their people doing everything and only serving customers when enough of them turn up at the till, hence the 'queue shuffle' I suppose. they scan your shopping at an unbelievable rate ... and I don't like to be hurried along. I think the cashiers have been specially trained as they scan your shopping at an unbelievable rate. One of my pet dislikes is when a cashier starts scanning the shopping of the next customer before you've had a chance to pack all your items away. It just feels rude and I don't like to be hurried along. As it happens I don't dither with my shopping like some people do and I have a small bag. I usually only buy a handful of things but even with that I can't keep up with the Aldi cashiers when they're on a mission! I get the impression they don't really want you to pack your bag at the checkout either, preferring instead that you grab everything and go pack your bags in the area just beyond. One more thing. They don't have hand baskets, only the trolleys where you need to put in a pound deposit. I often don't have change and find myself wandering around the shop trying to hold on to everything whilst grabbing the last couple of bits and preparing to join the rest of the cattle at the checkouts. 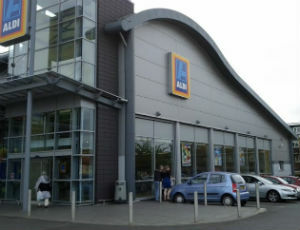 The comment from Sir M regarding Aldi has been stolen from https://www.reviews.co.uk/company-reviews/store/aldi. I know this because it was me who wrote it. Please write your own. Aldi checkouts are notoriously fast. The company say it is to speed up the shopping experience with them. Well sorry, but it does the opposite for many also, driving them away. It is shameful to watch at times the way elderly and others less able are treated at the checkouts. Slowing down for them? Not likely. The company state that they instruct their staff to slow down for these people. Do they? Well it is blatantly obvious that their staff do not listen. I will not go into the issues regarding the quality of their food items. You do, after all, get what you pay for don't you. Health and safety issues abound in Aldi stores. Staff pulling pallet carriers around at all hours of the day filling shelves and generally getting in the way. If you ask them if they will let you by all you get are sarcastic glares. I speak here of the Dover store in Kent, but no doubt all are the same. Why are my items being thrown in my shopping cart? At least ASDA and TESCO offer assistance, which I never accept. Terrible service at the till, always feeling rushed and even was told i should do my packing at the bench. An Altrincham Aldi assistant named Richard couldn't have helped more the previous week buying garden furniture. I love Aldi's prices and products but hate the rush at the check out. The cart switcharoo, demand of your pay out quick qiuck then switch carts, thrust receipt in your face and get your switched cart out of the way fast, fast!!!! Rude and disrespectful. I used to do all of my shopping there every week. Now I have not been there for 5 weeks! Ken D, It's not the checkout operators that are rushing you, they are ordered to adopt these tactics by management (who are ordered from head office, who are ordered from the owners) If you want to complain write a letter to their head office. Till staff are also under pressure and monitored constantly, those employees are only trying to hold onto a job. I do not pay until I have finished packing now, then they cannot rush me off the bagging area. I work in Aldi myself you are not meant to pack at the tills... there are signs at each end of every checkout that says please pack at the packing bench!! If you want your shopping cheaper let the staff scan your items as quick as possible and pack were you are meant to... it's the same people who complain there are ques yet they stand there packing a freezer bag a fridge bag... OK if the customer is always right and they want to pack there and we as staff wait that's all well and good but why should other people in the queue have to wait for you? one will ever be open at a time. As I said, I've quit them; it's just too frustrating. Yep, so fast they often give you the wrong change. Gave a tenner for small amount, got no change. Too late as cashier keyed in amount tendered as exact sum not £10. They have lost a good customer. You would think Aldi Checkout was a RACE. A lot of times the Cashiers make mistakes because they are in Such a Rush. Make Sure you pay close attention at checkout. I would shop more at my local aldi.but with a few items .it would take a long time to get served.people let you go in front of them.self checkout would be good for me. Ok, this is my analysis of Aldi. Go in there with the knowledge that it will be to the point. Put your shopping in your trolley, have your big bags at the ready. I have three, and just keep up with the till operator. Pay and out to enjoy the rest of your day. If you enjoy a more leisurely pace, try Tesco. I wouldn't advice shopping at Aldi if you're not physically fit or unaware of the speed required of you at the tills. You will hate it. I am told, the reason for this is, the til operator has no choice, or they get fired. So there's absolutely no point getting on their backs. They're just doing their jobs. Will I shop at Aldi for all of my groceries. No, but only because it's quite limited on variety and, as mentioned above, the cleaning products don't come up to scratch. Maybe some of us would rather have decent service!